Connect, control, charge, and play an iPod through your factory GM Radio. Supports Pandora Internet radio, Livio radio, i-Heart radio, and Sirius XM Apps! Designed for newer GM. Vehicles with Navigation or In dash 6 Disc changers. Full On screen Display and control from Nav Radio Screen. Scroll through and Select, Playlist, Artist or Songs directly on Nav Radio. Works on all new Nav Radios with Mp3 capability! Control, Play and Charge though the Factory Radio. Displays Song Title, Artist, Playlist info on radio. Back word compatible to most 2007 and up vehicles. 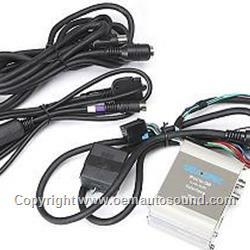 Works on vehicles with and without Sat Tuner button. Works on vehicles with or without Sat tuner activated. No loss of In Dash 6 Disc Changer or Sat Tuner features or functions. New Dual Mode standard on all USA Spec interfaces. Comes with new 4G Charging cable! Charges all new and older iPod's iPhone's. 6 for direct mode and then select PANDORA, LIVIO, or SIRIUS XM right from your iPod. Sirius XM - Choose Direct Mode, select your Sirius XM iPhone app, and pick your favorite station. or steering wheel controls allow users to skip forward to next song. or steering wheel controls skip through to next saved radio station. have satellite radio, In-Dash 6 disc changers, Mp3 player, Navigation Units, and Rear seat Entertainment. Additional cable - CB-GL29 needed if the vehicle DOES NOT have XM Receiver.